The first, unprecedented, Pedestrian Safety Report and Action Plan examines over 7,000 records of crashes that have caused serious injuries or fatalities to pedestrians, and indentifies underlying causes. DOT will use this data to inform the work the agency does to reduce traffic fatalities and make New York City streets safe for everyone. Building on the Action Plan, DOT has launched an anti-speeding ad campaign to improve safety for pedestrians, motorists and cyclists throughout the city. Read the press release announcing the new campaigns. 2009 was the safest year on record in New York City history. Traffic fatalities in 2009 were down by 35% from 2001. NYC’s traffic fatality rate is about a quarter of the national rate and less than half the rate in the next 10 largest U.S. cities. Traffic crashes cost the City’s economy $4.29 billion annually. Pedestrians are 10 times more likely to die than a motor vehicle occupant in the event of a crash. Serious pedestrian crashes are about two-thirds deadlier on major street corridors than on smaller local streets. Most New Yorkers do not know the city’s standard speed limit is 30 m.p.h. 79% of crashes that kill or seriously injure pedestrians involve private vehicles, not taxis, trucks and buses. Manhattan has four times as many pedestrian killed or severely injured per mile of street compared to the other four boroughs. 43% of pedestrians killed in Manhattan lived in other boroughs or outside New York City. Re-engineer 60 miles of streets for greater pedestrian safety, according to corridor crash data. Re-engineer 20 intersections for pedestrian safety on major two-way streets. Launch a pilot program to test the safety performance of neighborhood 20 m.p.h zone. 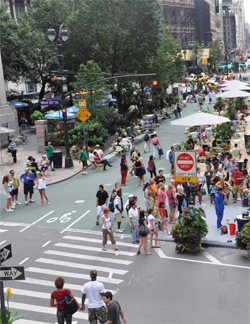 Implement pilot program to improve visibility at left turns along avenues in Manhattan.